While other designers were caught up in the difficulties of WWI, Gabrielle Coco Chanel was quietly building her fashion empire in the backwater of Biarritz, far away from the front line. She managed to combine comfort and practicality with beauty and elegance using the new Jersey material which had been rejected by others as only good for underwear and scratchy garments at that. At a time when vibrant blues, greens and oranges, silks, furs and feathers had been fashion essentials, Coco Chanel managed to convince the fashion conscious that beige was chic. Buy this poster at Amazon! Her "make do and mend" skills from her harsh peasant upbringing stood her in good stead at a time when the shortage of materials meant that the opulent and luxurious fabrics used by designers such as Paul Poiret were hard to come by. Coco's first appearance in a fashion magazine was in Harper's Bazaar America in 1916, though not many people noticed. Her new Chemise Dress was pure in line, had no waist and dropped to well above the ankle in an era when American ladies still wore their dresses trailing to the ground. It had a masculine waistcoat and a large sash around the hips. It was another four years before she made it into the Paris fashion journals, but she had made a decisive change in fashion which was to last the rest of the century. Women had the right to be comfortable, and move freely. Coco had always been sporty and had shocked French fashionable circles long before by wearing trousers to ride, and by bathing in the sea. Her simple, elegant lines and comfortable clothes have endured to the present day. 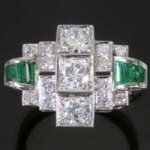 Famous for the little black dress and the smart suit, Chanel is also credited in some circles with the invention of the term "costume" jewelry and certainly promoted and included materials such as Bakelite in her accessories collections. 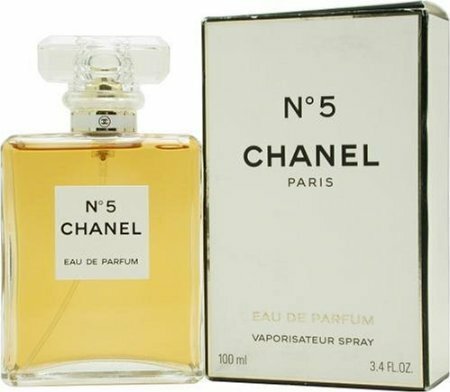 Buy Chanel No 5 Now! But it wasn't her clothes that made the bulk of her fortune. Her foray into the world of perfume in 1920 was to be one of the spectacular success stories of the century. She rejected the scents of the past which were always floral and demanded from her chemist collaborator a perfume with over 80 plant, animal and synthetic ingredients which would last the day and avoid the need to put on too much scent. 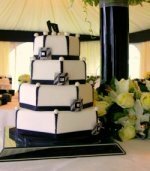 The container was a dramatic departure from the pretty ornamented bottles people were used to with its plain cubist shape and the striking black and white label saying just Chanel No. 5. 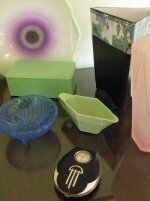 It has become an Art Deco style icon. As well as the clothes and perfume we all know and love, she returned to her beloved theatre (she had tried to make it as a music hall singer in her early years - hence the name Coco) as a costume designer for Jean Cocteau and Diaghilev's Ballet Russes, working alongside such giants as Picasso and Stravinsky. She also spent some time in Hollywood at the invitation of Samuel Goldwyn creating costumes for films. 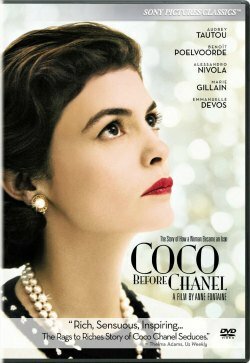 Coco Avant Chanel Movie Poster - Buy Now! 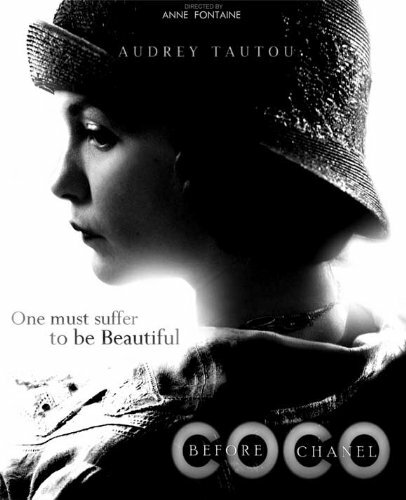 And talking of films, check out this great DVD about Coco Chanel. I adore Audrey Tautou and she is brilliant in this. Click the image to buy from Amazon USA. For DVDs from the UK and Australia click here. 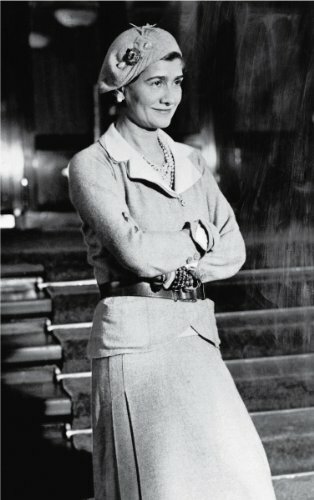 From her humble beginnings in the countryside of the South of France, Coco Chanel rose to hobnob with the aristocracy, the rich and famous and the greatest artists of the day. She was tragically unlucky in love. Her beloved "Boy" Capel married someone else and then promptly killed himself in a car accident. She also had affairs with a Russian Grand Duke, Paul Iribe - the fashion illustrator, the poet Pierre Reverdy, Igor Stravinsky, and the Duke of Westminster among others, but she never made it down the aisle. After the death of her mother at age 12, and the abandonment by her father who left her in an orphanage, she had developed such a strong independent streak that she was determined to make it on her own. She launched herself into work and never really stopped until her death in 1971. "Always take away, always pare down. Never add.....There is no beauty without freedom of the body"